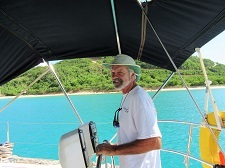 Sail along the Caribbean coast of Antigua with George and Stacey, where the waters are turquoise and always calm, but the wind is a breeze. Enjoy the comfort and safety of this beautiful 52’ Oceanis yacht. She is licensed and insured for up to six (6) guests with plenty of room to move around, above and below decks. The roomy cockpit has cushions for comfort and an awning for shade. There is a swim platform on the stern for ease getting in and out of the water and a fresh water rinse. Did someone say, “Let’s go to the beach!”? There are a few not so far from here! A brief sail to a quiet beach, it is all yours. Or float on noodles with a chilled glass of rose’ and give yourself over to the afternoon. Let’s get everyone on board and sail out to greet the sunset. How about another frosty beverage or champagne and hors d’oeuvres? Blissfully sail with the setting sun the lighting is now picture perfect. Before heading in, observe the sun as it disappears; perhaps you will be blessed with the green flash to end the perfect day. 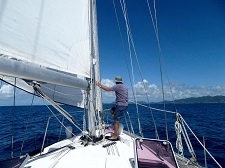 This 6-hour sail mirrors all the enjoyment of the Full Day. We will have you back at the dock, salty and sun kissed in time for your evening plans ashore. Note: All-inclusive prices in usd. Book NOW! Check out our 3 to 3 which is coming soon! Click here to read about the owners of Gadaboat.